Meet Paola. 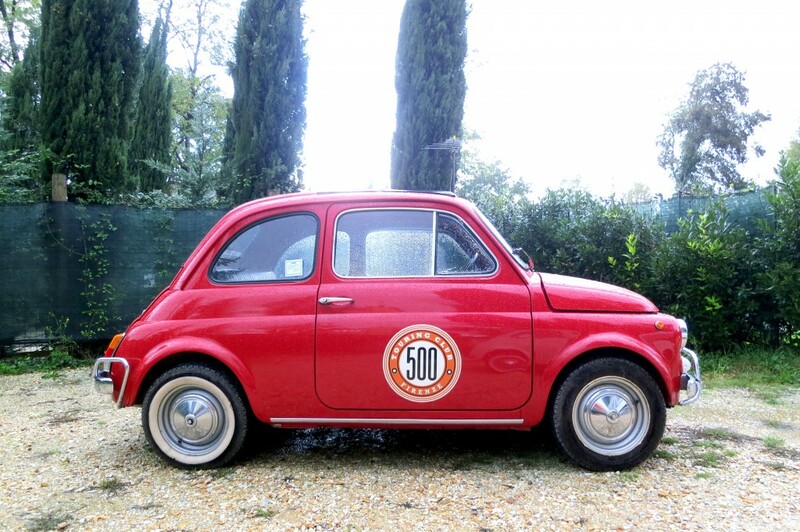 She’s one hot 46 year old Fiat 500. In order to drive Paola you must know or quickly learn how to drive a doppietta, double clutch. 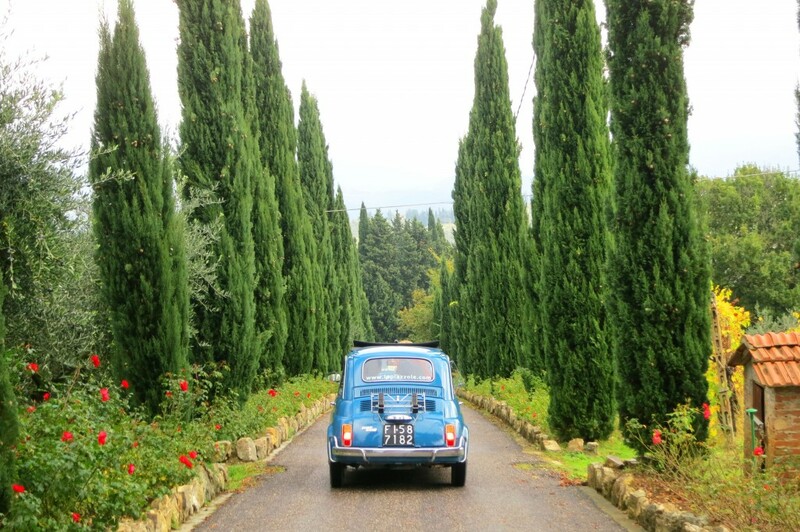 Luckily, my husband Nicco is a stick shift pro, so happily took on the challenge while I jumped in the passenger seat for a full day zipping around the Tuscan countryside! I was invited on this unique tour by the ultra friendly husband and wife team who runs and owns the 500 Touring Club in Florence. 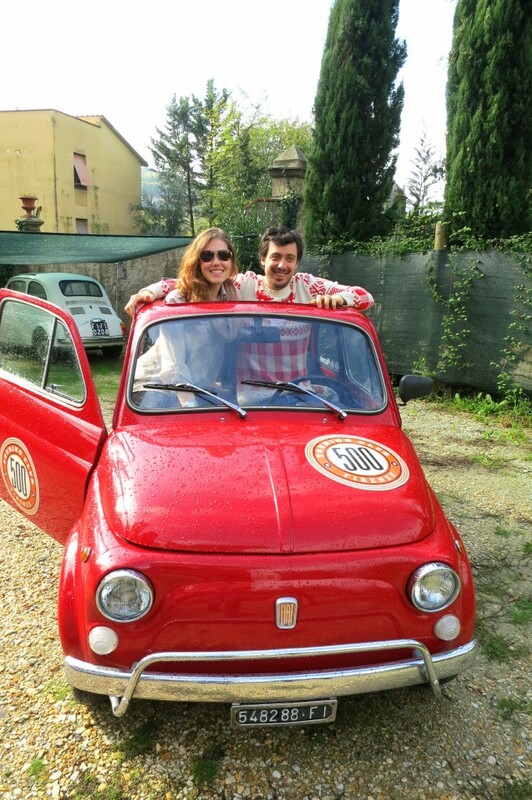 Giuseppe or Beppe for short (a Florentine man of all trades) and Andrea (a backpacking Australian) have been the proud owners of eight adorable Fiat 500 machines for two years now. Their hilarious staff of one, Lindsay, also joined Nicco and me along with four female writers and their dates for an amazing day in the countryside. 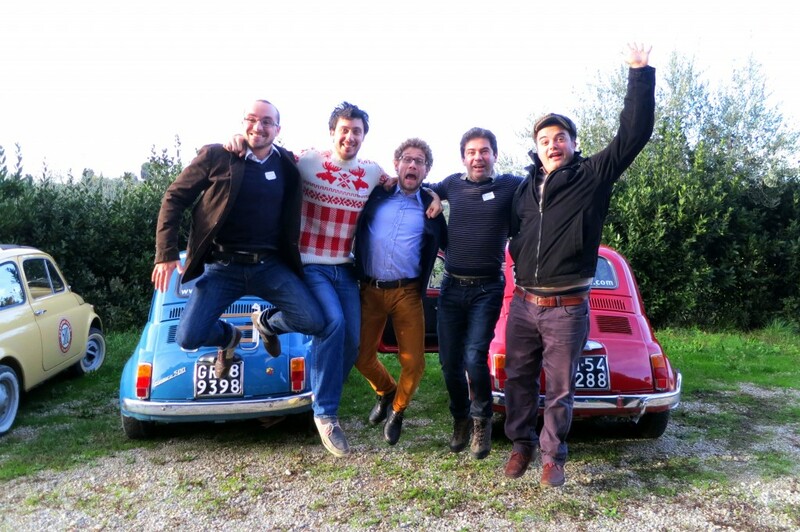 The Take No Prisoners Fiat 500 Squad! The meeting point was at the 500 Touring Club’s clubhouse about a 25 minute bus ride from the center of Florence. Lucky for me, we showed up first so got first dibs. I saw Paola sitting there, soaking wet in the rain. Like Audrey Hepburn in Breakfast at Tiffany’s, she looked lost just yearning to be loved. Was it her red color that caught my eye? Was it her obvious need for attention? Was is the fact that she would be the perfect prop to take our Holiday pictures with? Who will ever know. Maybe I chose Paola because she’s so outspoken and driven…Paola loves a good pun. 😉 She soon proved to be quite the macchina and model. what a fun road to cruise on! 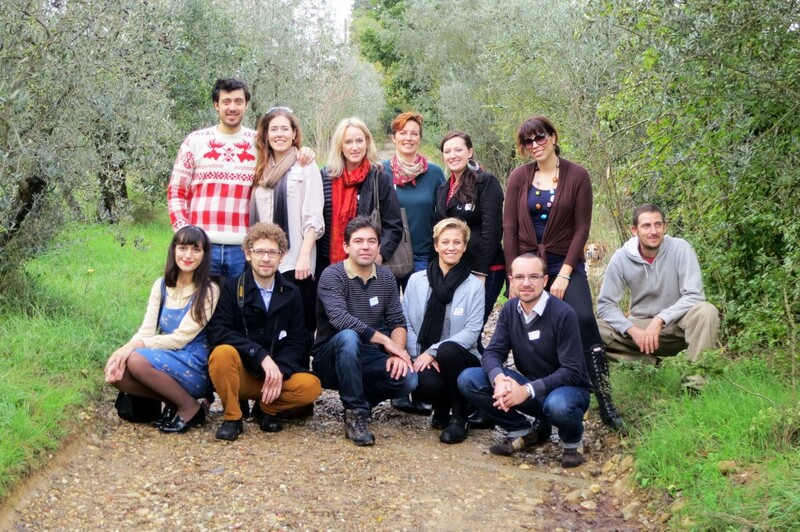 The initial plan was to pick olives at a nearby farm, but due to the morning rain we moved right to the olive oil tasting. I couldn’t complain! Funny enough, Domenico, the owner of the olive orchard is my husband’s grandfather’s nephew. So, would that make him my second cousin-in-law?? A brain cell just died. I never meet Domenico before, so it was really funny being introduced to him on the tour. 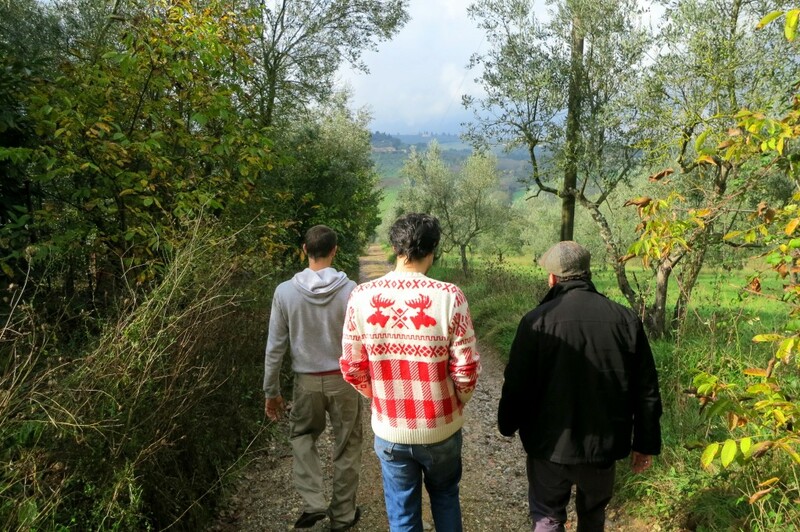 He took us on a walk through his olive farm showing us his rambunctious geese, Livornese chickens and bee hives. The man does not have a bad view either! 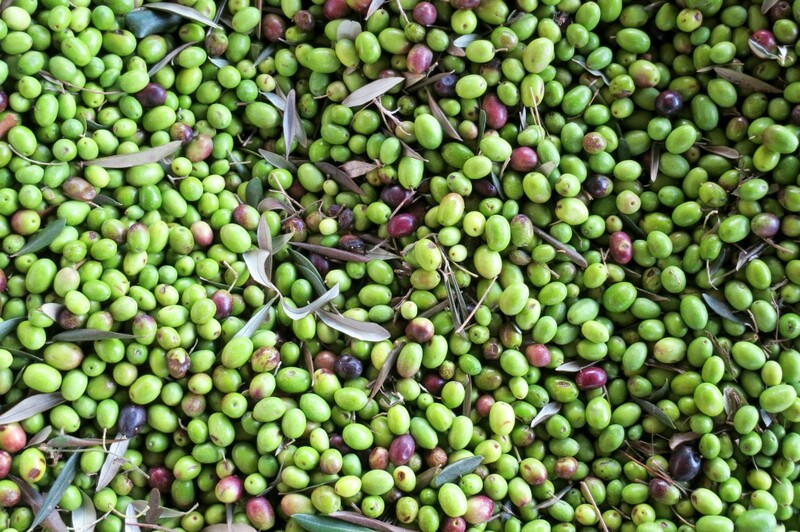 We were able to soak our slices of Tuscan bread into a fresh bath of olio nuovo—fresh extra virgin olive oil. 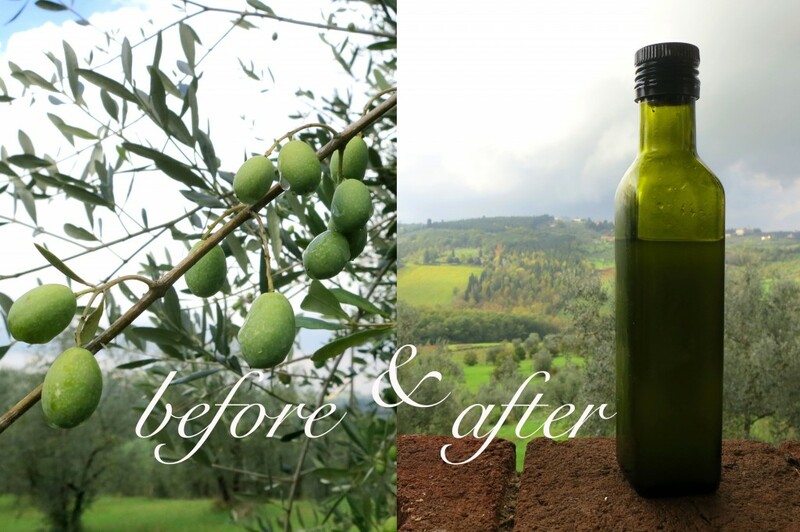 The oil was out of this world and a few bloggers even bought large bottles of Domenico’s olio nuovo for just 10€. Great deal. Paola was so upset that she wasn’t able to taste any of the EVOO, so I promised her a photoshoot, just the three of us at the next stop. isn’t this totally Pinterest worthy?! We were now on our way to Agriturismo Inalbi the frantoio, oil press. Once we parked our priceless gems and walked through more rows of cypress trees the olive oil smell grew stronger and stronger. I could have waved some bread in the air and eaten the scent right up. The frantoio was a well-oiled machine…oh there slips another pun! 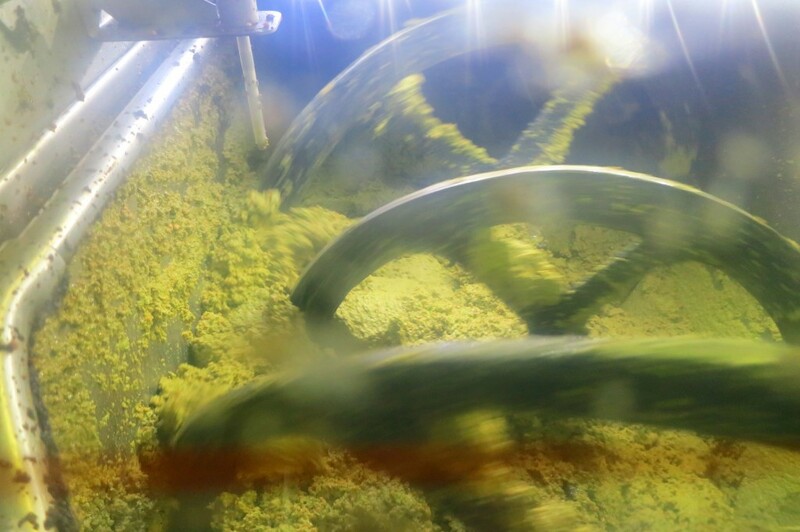 It was a decent sized room where the olives roll through washing, grinding, separation and draining stations. 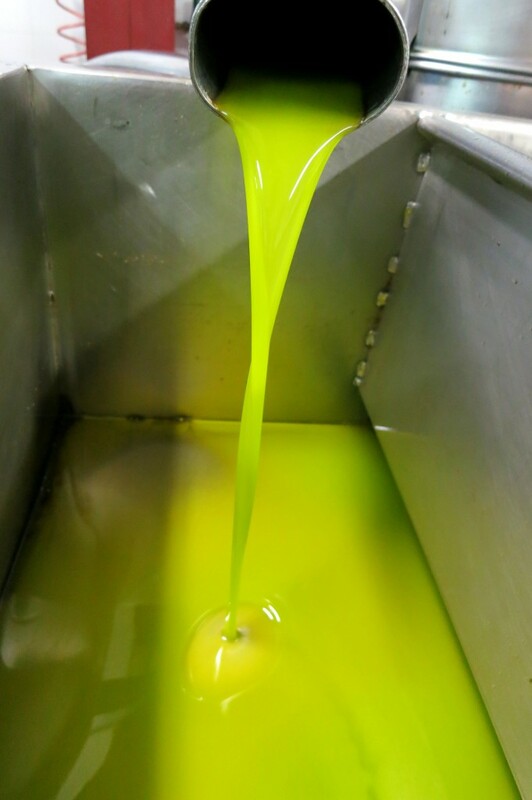 this neon liquid is ready to drink, eat and even bathe in — olio nuovo, A.K.A. Green Gold! Once the green gold part of the tour wrapped up it was time for Paola to get her moment. What do you think? Isn’t she gorgeous? 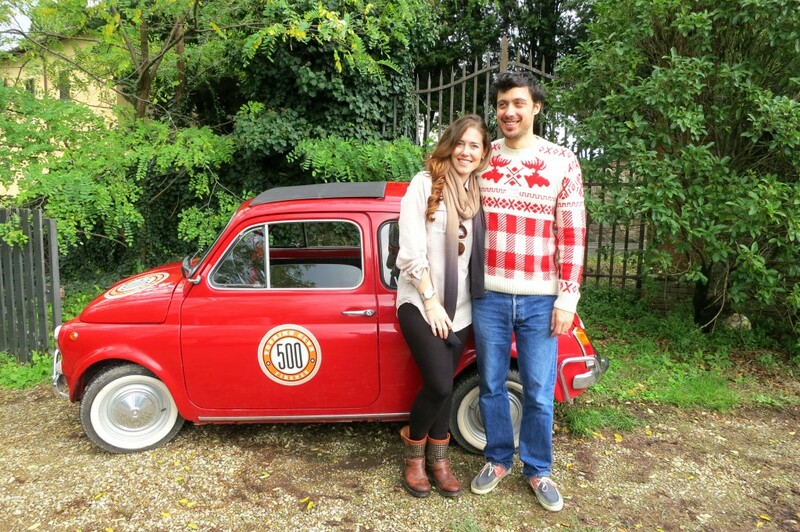 Nicco dressed appropriately in his Xmas sweater…matching Paola of course! Nicco and I took a few more funny shots, but we’ll use them for our Christmas card. I wouldn’t want to ruin the surprise now would I? 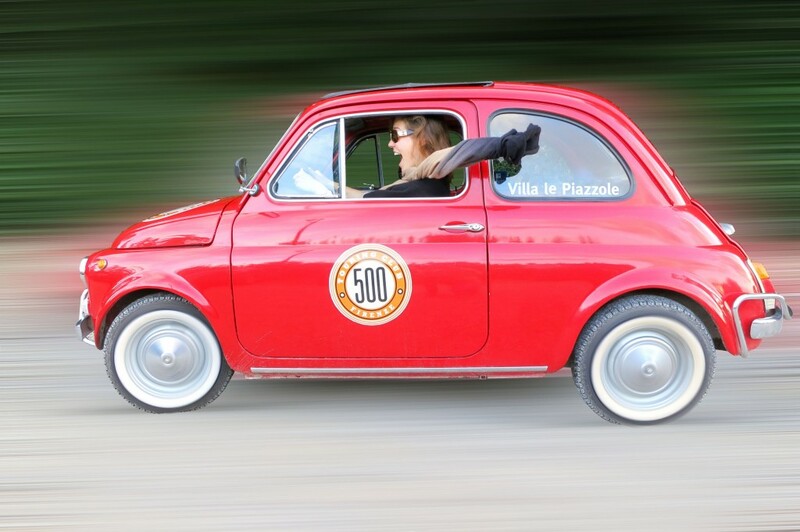 After all the olive fun and breathtaking kilometers filled with windy, curvy and sometimes narrow lanes through Tuscany we headed back to the 500 Touring Club’s headquarters. They’re conveniently located down the hill from the ‘I would love to honeymoon here’ Villa Le Piazzole. As we set foot on the 600 year old premise it felt like it was our own private property for the day. 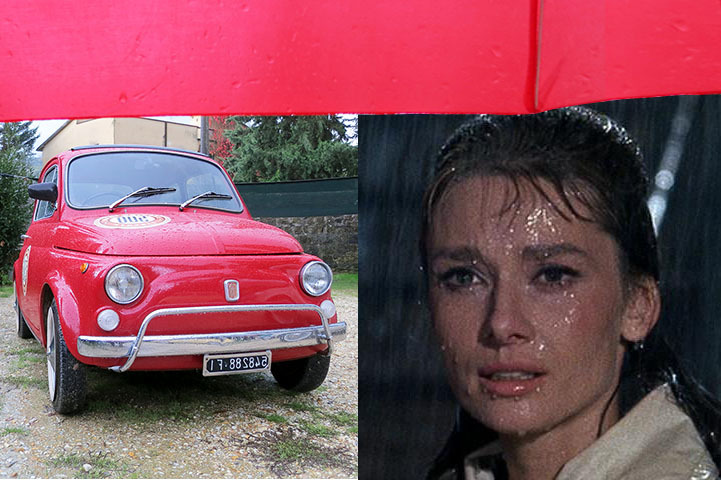 They have a pool where some of the Fiat tours actually end up for a picnic lunch, perfect for summertime! There’s a gorgeous garden to the side and below the very cool and private cantina was awaiting with Tuscan treats for our hungry bellies. Red wine, white wine, sparkling water were all waiting for us. 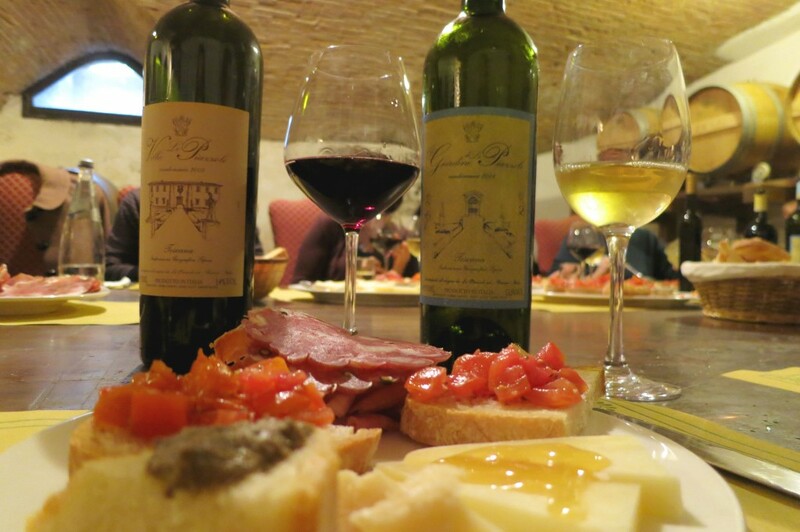 Plates were filled with bruschetta, crostini, pecorino cheese, parmigiano cheese, prosciutto and salamis. We even had the chance to drizzle Andrea’s private VIP stash of honey. Warning: Fingers were licked during this meal, multiple times. The day was magical. 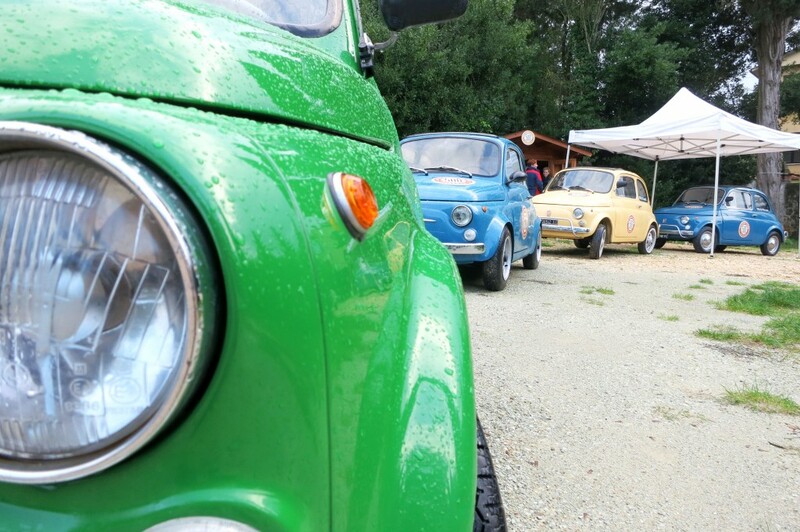 Nicco had the best time driving a vintage doppietta. 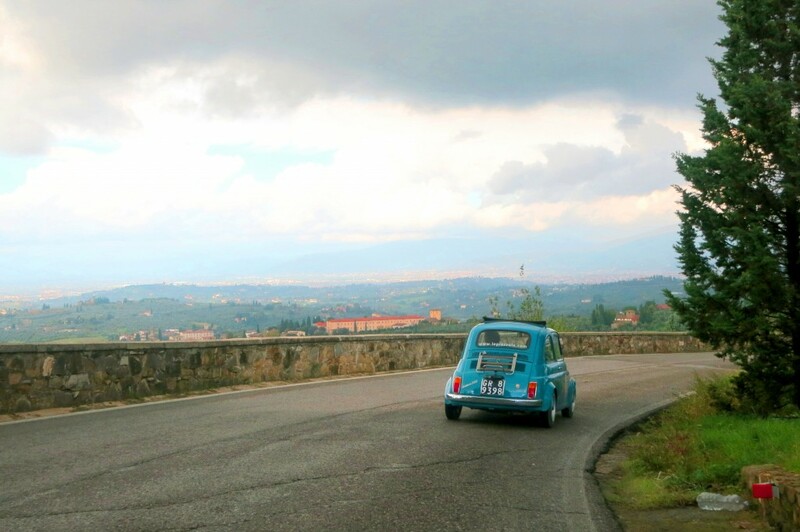 The sights were amazing and it was hilarious to honk through a few little towns we drove by…even cyclists were doing double takes when they saw our crew of Fiats whiz by them. Fellow bloggers—Georgette, Alexandra, Alessandra and Lisa—and their dates made the tour even more memorable, so thanks Fiat crew! A special thanks to Paola for being so nice to us during the drive and to Andrea, Beppe and Lindsay for their amazing amounts of hospitality. Beep beep! *Tours range from 65-200€ a person depending on the tour. Find the 500 Touring Club on Facebook and Instagram. What’s the most memorable tour you’ve been on? Love this post, share it! Love the pics, pin them! wow tiana, you’ve just said it all!! Now what will I write? Love the puns and dry sense of humour. Thanks Alex. The second I saw Paola I instantly saw the Audrey resemblance. I am sure you have something clever and great up your sleeve for your post! Actually for once i have no idea what to write. Ha, we should have brought a loaf of bread with us!! It was great meeting you and Alf too. I hope you had a great time at the vintage shops downtown…and your stay in your gorgeous villa room! Fiat 500’s are definitely my favourite car, so much fun and they look soo cute! They are the cutest tiniest things, love them too! For sure! We were all so giddy, good times were had!